Why do lobsters turn red when you cook them? So working in a lab where the ratio of students who study the American lobster outweigh the lone grad student (me) who studies the horseshoe crab, Ive taken an interest in lobsters. Along with horseshoe crab work, Ive been doing a lot of field work pertaining lobster. So when I tell my friends back home what Ive been doing this summer, this question usually pops up, "Why do lobsters turn red when you cook them?" When you first catch a lobster, it is usually brownish reddish in color. But when you boil it or cook it, it turns bright red. "Their shells contain astaxanthin, a carotenoid from the same family of organic pigments that includes beta-carotene, the source of carrots' bright hue. Astaxanthin is also responsible for the pink coloring of flamingos, salmon, krill, shrimp and crabs. Free astaxanthin appears red, but when it binds to proteins in the lobster's shell, the bonds twist the pigment, changing its color. Depending on the type of protein it bonds to, there's either what's called a bathochromic shift, which turns the pigment blue, or a hyspochromic shift, to yellow. When you're looking at a lobster, you're seeing light reflecting through different layers of free and bonded astaxanthin--a lot of colors mixed together, hence the muddy brown." 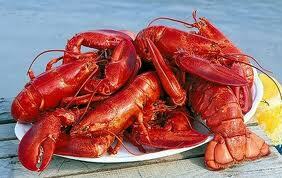 Once you cook the lobster, the heat "denatures" or breaks the protein, releasing the pigments leaving a bright red color. Diet also plays a part of the coloring for the lobster. Folks at New England Aquarium in Boston, MA have raised white lobsters feeding on a specific diet. It's kind of like what they say, "you are what you eat"